This section describes how to schedule your course in Studio. For information about providing other information for your course, see Setting Details About Your Course. The start and end dates you set for your course and for course enrollment are important for prospective and current learners. As soon as enrollment starts, prospective learners can see your course in the course catalog, view the course About page, and enroll in the course. Current learners see your course start or end date on their dashboards. EdX recommends that you consider your course start and end dates, and its enrollment start and end dates, carefully. After you determine the dates for your course, you set these dates and times on the Schedule & Details page in Studio. 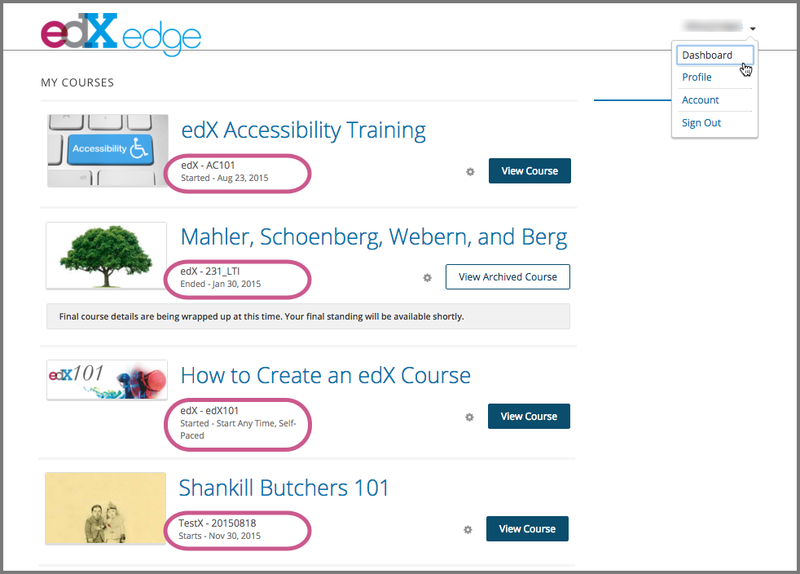 EdX recommends that you verify all important dates in Studio one week before you plan to start the course. The course start date and time specify when learners can access published course content. By default, the course start date and time are set to 01/01/2030 at 00:00 UTC to ensure that your course does not start before you intend it to. You must change this setting to the correct date and time for your course. EdX recommends that you set the start time of your course early in the day, generally 00:00 UTC or earlier. Learners often expect the course to be available on the start date in their own time zones and try to access course content during the day. If you do not specify a start time for your course, learners see the default start time, 00:00 Coordinated Universal Time (UTC). Learners can see some parts of the course before the course start date. For example, they can see your Home page and course-wide discussion topics as soon as they enroll in your course. For more information, see Create Course-Wide Discussion Topics. You can set a different advertised start date for your course. You might do this if the exact start date is uncertain. For example, you could advertise the start date as “Coming Soon”. For more information, see Advertise a Different Start Date. The course end date and time specify when learners can no longer earn credit toward certificates. Learners can continue to complete coursework, but cannot earn credit after the course ends. Learners who have earned certificates can view the certificates soon after the course end date. If you do not set a course end date, learners cannot access earned certificates. The enrollment start date and time specify when learners can start to enroll in the course. Ensure that the enrollment start date is early enough to allow learners to both enroll in and prepare for the course. The enrollment end date and time specify when learners can no longer enroll in the course. Ensure that the enrollment end date is late enough to allow learners adequate time to enroll. The enrollment end date cannot be later than the course end date. To set dates and times for the course and for course enrollment in Studio, follow these steps. 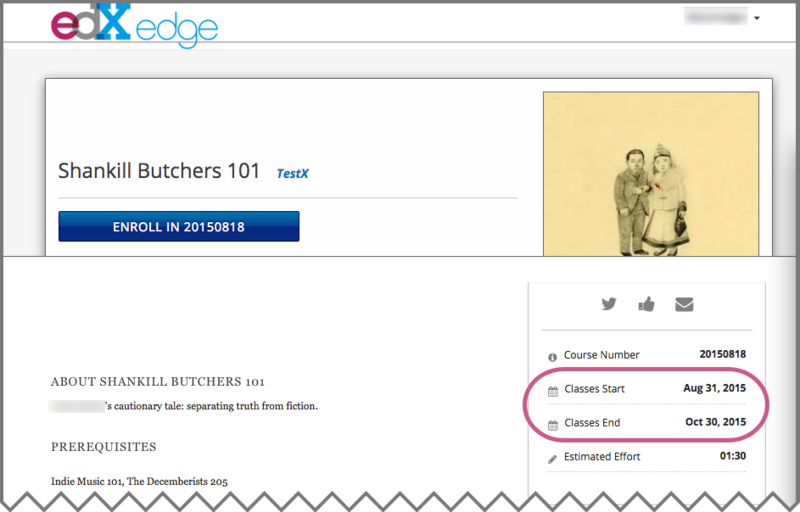 In the Course Schedule section, replace the placeholder dates and times with your own information. The times that you set, and the times that learners see, are in Coordinated Universal Time (UTC). You might want to verify that you have specified the times that you intend by using a time zone converter such as Time and Date Time Zone Converter. EdX recommends that you verify that all important dates are correct one week before you plan to start the course. You can advertise a start date for your course that is different from the course start date you set in the Schedule & Details page. You might want to do this if the exact start date is uncertain. You can enter a specific date or a description. For example, you could advertise the start date as either “15 Oct 2016” or “Anytime, self-paced”. To set an advertised start date in Studio, follow these steps. Locate the Course Advertised Start Date field. The default value is null. Enter the start date that you want learners to see for your course in MM/DD/YYYY format. A date value entered in MM/DD/YYYY format appears to learners in DD Mon YYYY format. For example, 10/15/2016 appears as 15 Oct 2016. Add quotation marks (" ") before and after the start date value. An example follows. If you do not change the default course start date (01/01/2030), and the Course Advertised Start Date policy value is null, then no start date appears for the course. Learners just see that the course has not yet started. Learners can view the start date for a course on the course About page, and, after they enroll in the course, on their dashboards. To find the URL of your course’s About page in Studio, select Settings and then Schedule & Details. After learners enroll in your course, the course appears on their course dashboards. To access the dashboard, learners select their usernames and then Dashboard. For a course that is in progress or has not yet started, the start date is shown. For a course that has ended, the course end date is shown.